I have a feeling you might have taken what I've said above out of context or misunderstood what I was saying. That's OK though, all the best in your travels. I hope you still persevere. That looks like a fantastic improvement to the game. Interkarma said it was hard, but not impossible, and at some point (post 1.0) I think eventually DFU will move towards being less a 1:1 DF engine and more a spiritual successor as mod content grows. I still hope it's a misunderstanding on my part, but I don't see how. If replacing a bunch of town buildings is task bordering with impossible (an not planned to be improved on, that's why you suggested looking for a game/engine with different goals), what is the intended scope of modding? 1:1 asset replacers and minor cosmetic additions only? Just adding more of the same? I'm sorry if I sound a bit antagonistic, but I had higher hopes for modding possibilities than what they are turning out to be. Edit: Furthermore no one even bothered to answer any of my technical questions regarding the paperdoll graphics. Could be nice so that I didn't possibly continue walking into a blind alley. Kind of important when it comes to sinking potentially hundreds of hours into something. Well, I may say just playable and bugless daggerfall is already an achivment - Daggerfall version of Xngine is total buggy crap, additionaly many and many game important scripts are broken. Additionally, there is many and many gamedata related issues, and to resolve them and sort all things, reverse engeneer not only properly how it was, but how it intended to be. Currently Daggerfall Unity is even before 1.0 version, so all this things are not in focus. I have some technical questions unanswered too, but I know that developers already work hard enough on making this thing work, so better just wait when at least DU will hit full beta. Yeah, now researching every city block, I see that same way as many other aspects of the game, they was just slapped very fast from very limited amount of models. Kaucukovnik - just speaking as a player (someone who has no experience creating mods for or developing DFU to this point), please don't blame DFU for problems with Daggerfall's original construction. Morrowind and later TES games (just to take often compared examples) were built from the ground up with player modding in mind; Daggerfall wasn't. Nevertheless, the DFU developers (led by Interkarma) have worked tirelessly in their spare time for years to work around the many limitations of Daggerfall's vanilla data and scripting, and even where we are now (with a few significant features left to be completed over the next few months before 1.0 is reached), they've clearly enabled and actually implemented much more than "minor cosmetic additions", with changes not only to the UI screens and graphics possible, but also dozens of bug fixes to vanilla quests, major improvements to enemy AI, fixes to game controls, etc. It would be a shame if you actually want to bring something to the table in terms of DFU modding but were prevented from doing so by a misunderstanding. Regardless, DFU is already much superior in terms of stability and playability compared to vanilla Daggerfall in my experience, and sticking with the obsolete vanilla Daggerfall in future while ignoring the evolution of the game that is DFU seems pretty incomprehensible. But I'll leave it to the developers who have time here to answer your specific technical questions. Again, hopefully you're able to contribute if you're willing, but if not, best of luck. Interkarma, always an extremely pragmatic person from all that I've observed from him, is merely shooting the minimum possible boundary here. He is the kind of person to save people time if something goes wrong rather than let them run into mistakes themselves. The fact is that Daggerfall Unity can reach the point of a Total Conversion. We can replace town blocks, change buildings, change entire systems, and replace practically anything. As long as Unity can do it, Daggerfall Unity can do it. If we wanted to turn Daggerfall Unity into a merchant simulator where you barter the best prices in the morning and try to sell your stock by the afternoon, that's completely possible. A massive array of things are possible because it's Unity. Now the important question is who would do it. Interkarma has made abundantly clear that he is excluding all possible deviations from the core game at this stage of development, at least until 1.0. Considering that he has invested 5 years of a productive life in a completely free game on top of every other responsibility he has (which he only hints at but are clearly not trivial), I have every reason to believe his post-1.0 engagement will be a fraction of what it is now. I do not blame him. No one else has promised a massive, mod-based deviation from Daggerfall based on the requests of the community either. If after 1.0 (that's the key phrase here: we're setting up the scaffolding that can later be modded) someone else wanted to come in and write enormous mods spanning several GBs to satisfy community wishes, I don't see why that couldn't happen. Once 1.0 is finished we will have a game that can be modded drastically. DFU devs know very well the frustration of writing a paragraph of new code that invalidates 25 pages of previous code, which necessitates first having the game finished and then adding ambitious mods that will alter the internal organs of it. So yes, what you ask is possible. No one will dispute it. I don't want anyone to believe Unity as an engine is somehow hobbled or deficient in its capabilities because it isn't. 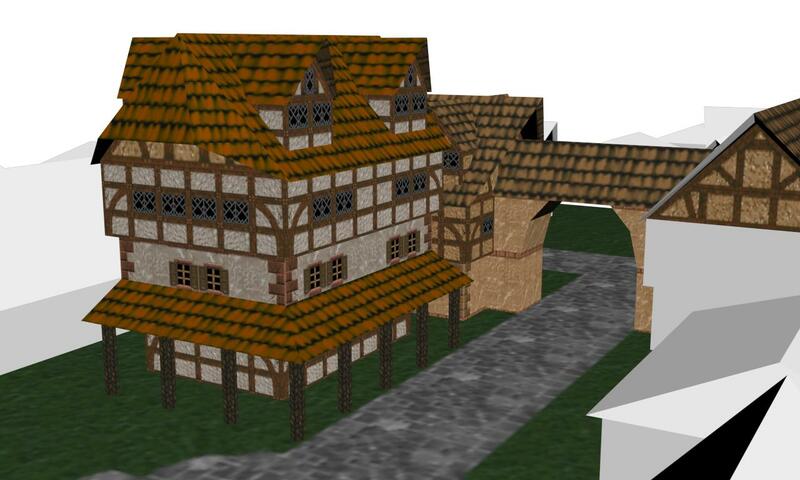 The question is who will invest the time into reinventing city blocks, which will alter the quest system and possibly invalidate many already-existing stores and residences, without mentioning the task of actually modeling and programming them into the game in a flawless way that ensures compatibility with DFU's streaming world. If you find someone who is willing to come here after 1.0 and invest that time into it, then that would be a great idea for a mod. Many people would enjoy it, I believe. To a far lesser degree is your concern about the paper doll, but still related. Who will invest the time to ensure that it fits properly onto the screen, that it is compatible with every one of Daggerfall's pieces of clothing and armor and weaponry, and other similar concerns? Find the dev and bring him/her here and there will be plenty to do. I myself have had to wait about 18 months for certain quest actions to come into play so I can continue my work modding DFU, which still haven't all appeared. There are some that I would very much like to use but I can't. What I do in those cases is I store away the ideas in a separate file in the hopes that someday I will be able to implement them. If you want to implement your work immediately on the risk that no dev will volunteer to make your artwork a part of a DFU mod, you are free to do so. If you wish to wait until it's a sure guarantee that it can become reality, that is certainly a good idea. Thank you for explaining the situation in detail. I think I'll export the finished pieces and upload them in case someone wants to try messing with replacement sprites. Then I'll wait and watch the game evolve. Well, and back to the topic - if it's not obvious already, I like these houses very much. At least some compromise built around vanilla door positions would be welcome. Good summary of the challenges in modifying the world content in any significant way. I've been a bit distracted by the parallelisation work I'm currently doing, but I wanted to add a few comments of my own regarding this topic. In summary (tl;dr): Anything's possible, but can be very difficult and as Interkarma says at a certain point it's actually easier to build a whole new game. Firstly DFU is a unity engine for playing DF in a modern engine, based on the original data files. If the modification requirements are such that the DF data formats are not sufficient, compatible or just too cumbersome to be a good choice, then DFU is not the right platform for those ideas. Modifying world content is something that I've dipped my toe in a little bit to be able to change building interiors for the Archaeologists mod. The world data replacement feature I implemented allows JSON world files to override the original DF data on the fly, currently just for building interiors (since that's all I required) but the same technique could be used for any aspect of the world data. So replacing buildings, or even rearranging entire blocks or creating new blocks etc. I'm not sure how scalable a solution it would be if someone were to replace entire towns, but it would always be possible to use JSON for development and then 'compile' to the original binary formats for release if performance was an issue. However, this still doesn't get around the fact that the developer of such a mod would need to work with the DF data formats, albeit in JSON text form which is much easier than direct binary editing. This is tricky and time consuming, but definitely possible - having done it for the Archs mod myself. It should be noted that it would be theoretically feasible for someone to create a world editor that was a GUI like later ES games that produced DF data files but this would be a very big task, and certainly not one I or Interkarma would be interested in taking on. (especially since either of us would be happy to just edit JSON files) I think it's very unlikely anyone will develop such a tool, but you never know what may happen. What I would be happy to do is extend the world data replacement functionality, as I've said before in various threads. That would only happen if someone were serious about using it, after developing the ability to add guilds in mods after a discussion on here and then finding those people who wanted it didn't actually use it and work on their ideas in the end, I'm wary of adding functionality for no reason. Although in this case the Archs mod came out of it so that was a good thing in hindsight as I doubt it would exist without those original discussions. I have no DFU modding experience or even unity experience in general, but personally I think that the possibility of adding the Temple Knightly Orders (with their own building types), giving Archeologists Guild their own overworld building type, making palaces have unique interior/exteriors, and maybe even populating the currently empty Cybiades (except for a single dungeon that's only explorable by wandering around the northeast section of the island) is reason enough to add that functionality in. However, I understand that adding that functionality is a lot of work and while I'd love to see a modder utilize that added functionality, it isn't guaranteed. So I'm in no rush for the function to be introduced.